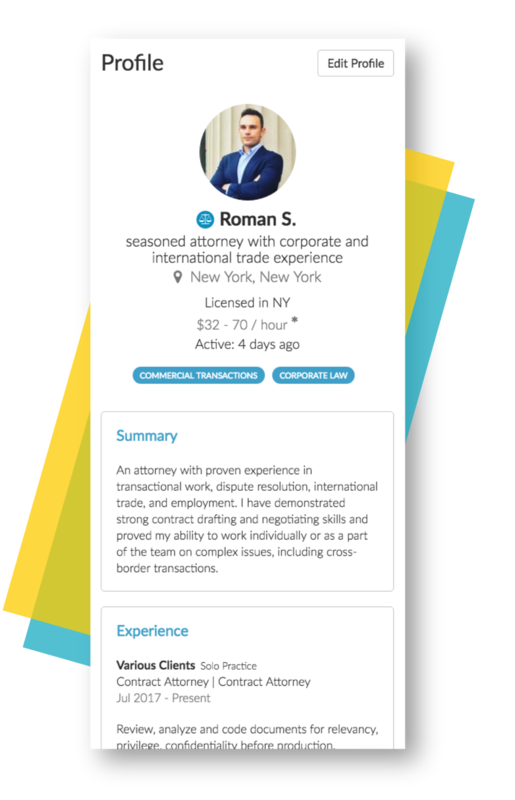 Hire an Esquire is bringing the legal industry into the gig economy, and we want you to be a part of it! Set your rates and manage your profile, availability, applications, and project communication all through our simple online platform. Our proprietary matching technology allows hiring firms to reach out to you directly for available jobs, cutting your hiring time in half. Search the Hire an Esquire marketplace for projects that fit your skills and schedule. Apply directly to any job and log in to see your status. Sit back, relax, and wait for a job that's a good fit for you. Track your time through our platform and get paid weekly by direct deposit and enjoy available insurance benefits and career assistance. We handle payroll, tax documents, and other administrative tasks so you can focus on building a career that you love. Ditch the recruiter and message your clients directly to discuss upcoming projects and hiring processes. Track your time, manage your projects, and receive weekly payment - all through the Hire an Esquire platform. We check bar IDs and school transcripts to ensure our professionals are in good standing within the legal community. We research each applicant's record for unethical activity or past complaints. We require a minimum of three professional references from previous clients or employers for all members on our platform. Our fit score assessments illustrate candidates' background, work style profile, behavioral interview analysis, and cognitive ability. Our recruiting team may reach out to candidates to schedule a brief phone screen to ensure they are a good fit for both our network and for jobs that they apply to. "Hire An Esquire placed me as an Assistant GC at a Fortune 500 company with my background as GC at small startups. The position was a perfect fit (leveraging my startup contract drafting/negotiating experience to a public company and rounding off my resume). The team is receptive, helpful and reached out to make sure all was going well."